Shares of real estate investment trust Retail Opportunity Investments Corp. (NASDAQ:ROIC) jumped 10% in January, according to data from S&P Global Market Intelligence. That beat the gain of about 8% from the S&P 500 Index, but it was a tad behind the broader REIT sector’s advance of a little under 12%. The performance story gets really interesting, however, when you go back to 2018. Last year, Retail Opportunity Investments shares fell 20%, much worse than the 6% decline in the S&P and the 10% drop for the average REIT. Basically, despite a decent bounce, Retail Opportunity Investments hasn’t really recovered from the goring it took last year. Retail Opportunity Investments owns a collection of grocery-anchored shopping centers. Although the broader retail space has been hard hit by the so-called retail apocalypse, a big headline-grabbing issue, that hasn’t been such a big deal here. The assets Retail Opportunity owns are necessity-based and have, for the most part, held up pretty well. But that’s not the full story, either. 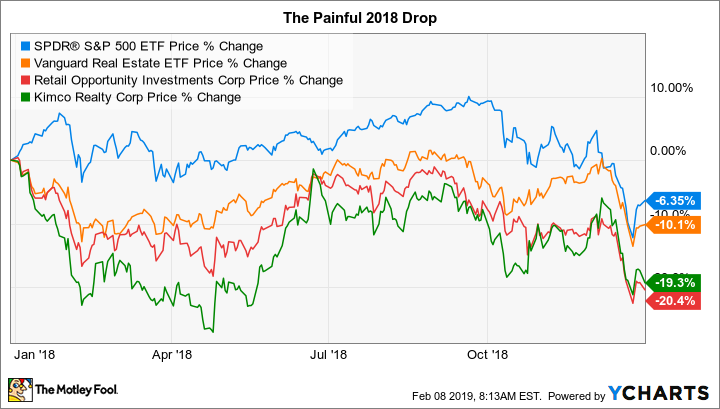 Kimco Realty (NYSE:KIM), one of the nation’s largest shopping-center owners, lost around 19% in 2018, yet it outdistanced the S&P and the REIT average in January with a 16% gain. That’s roughly 6 percentage points better than Retail Opportunity Investments did. Why? The difference boils down to diversification. Kimco’s portfolio of more than 400 properties is spread liberally across the United States, with a focus on wealthier regions. It has a notable presence on both coasts of the country. Retail Opportunity Investments’ portfolio of just 90 properties, in contrast, is focused on only three West Coast states, with major exposure to a relatively modest seven markets. Some investors might see a focus on the West Coast as a net positive, since it’s home to some of the most dynamic regional economies. However, pricing in key housing markets on the West Coast experienced a rapid escalation in recent years and, starting in late 2018, began to see a rapid cooling off. This has tap on implications for Retail Opportunity Investments, since the markets on which it has chosen to focus might not be as strong as investors had been hoping. And if the housing dislocation turns into a regional economic downturn, then Retail Opportunity Investments will face a very focused headwind. 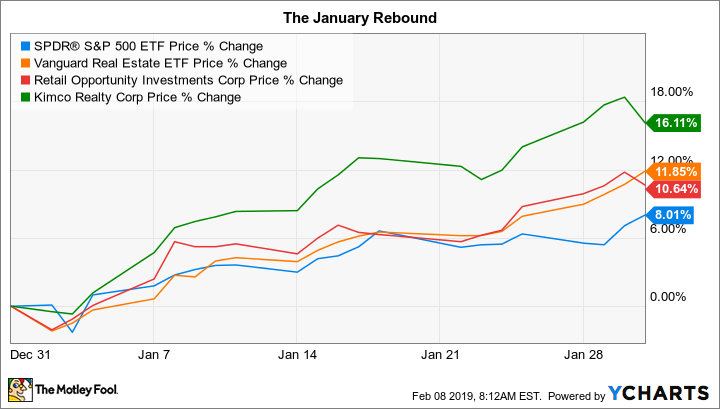 The REIT’s performance in 2018 and January suggest that investors are re-examining the benefits of the company’s highly focused portfolio. It’s hard to guess the direction of the market at any given time. It’s even harder to do so on a consistent basis. Mercurial investors were a factor in the recent ups and down at Retail Opportunity Investments. But there was more going on than just the big-picture moves in the S&P 500. Retail Opportunity Investments shows just how important it is to take the time to fully understand the companies you own. Sometimes benefits can also have corresponding liabilities.